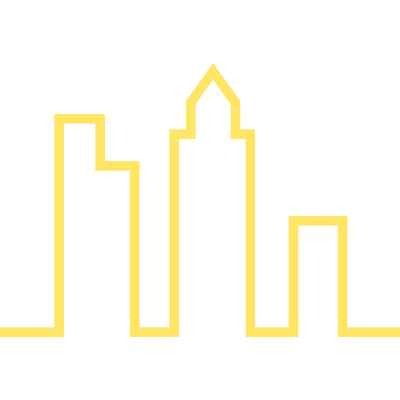 The Franklintown neighborhood is just north of the Ben Franklin Parkway and has been developing from a formerly industrial area to an upscale residential neighborhood for the last fifty years. Franklintown was originally developed by private developers who saw the potential to reimagine the declining industrial area that was east of 21st Street and north of the Parkway into the residential neighborhood it is now. The Community College of Philadelphia also saw the potential of the area for their campus, which has been growing over the decades into a large institution for the city’s working class. Now, in an attempt to attract more full-time students and international students (a growing trend among large community colleges), the Community College is partnering with Radnor Property Group to build two new apartment towers that would add to Franklintown’s growing residential options and expand the Community College campus. It is being designed by MY (Michael Ytterberg) Architects. The two towers will be built in phases at 15th and Hamilton Streets. They will replace a large warehouse once used by the Philadelphia Inquirer, formerly headquartered across 15th Street. A small one-story parking garage, next door on Hamilton Street, will remain and will have a green roof on top. The west tower will be built in the first phase and will be eleven stories tall. It will have a retail space and one and two bedroom rental apartments on floors three through eleven. Then the east tower will be built in the second phase and will be sixteen stories, and 186 feet, tall. That building will, also, have one and two bedroom rental apartment units. The entire project will have more than 600 units and 8,000 square feet of retail space. In between the two buildings will be a private courtyard, with trees, a garden, benches, and a trellis. The exterior of the buildings will have metal panels in four colors: blue surrounding the courtyard, and silver gray, gold, and dark gray on the street sides of the buildings. The retail will be covered with yellow awnings. There will be large windows with punched panels and some balconies on the upper most floors. There will be 150 parking spaces for cars, in the existing garage and in a new one underneath, and 230 bicycle parking spaces. The entrance to the new garage will be on 15th Street. The developers will keep a small railroad shed, which is located below grade where an old Reading rail line used to pass through, for parking. If the old rail line, called the City Branch, were to ever be renovated into a proposed park and/or a rapid transit bus route, then the developers would be willing to replace the rail shed with a stairway to the park and/or bus stop. This new development is intended for Community College students and non-students alike. It will provide affordable housing in an area that is developing with only upscale housing right now. Once a non-residential zone, the area around Broad and Spring Garden is being developed into a residential neighborhood. Across 15th Street from The Hamilton, is the western building of the Hanover North apartment development, which includes another companion building across Broad Street. Further to the north, the former State Office Building has been renovated into apartments and a new development is planned for the parking lot on the northwestern corner of Broad and Spring Garden, which would have an apartment tower and an office tower. A block south of The Hamilton is The Alexander, a high rise apartment building under construction between Vine Street and Callowhill Street. Two blocks to the west of The Hamilton is Museum Towers II, a new apartment tower next to the original Museum Towers apartment building. And, on the south side of the Vine Street Expressway, the former Glaxo Smithkline headquarters is being renovated into apartments and modern office space. 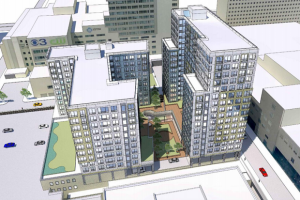 A block away, the Archdiocese of Philadelphia plans to work with a developer to build two more high rise apartment buildings next to the Cathedral of Saints Peter and Paul. So, The Hamilton becomes another piece in the residential puzzle for the once desolate eastern end of Franklintown, providing necessary housing for Community College students and Center City workers alike.